Winter stretches on. One way to get through it is to put some cheer on the plate. 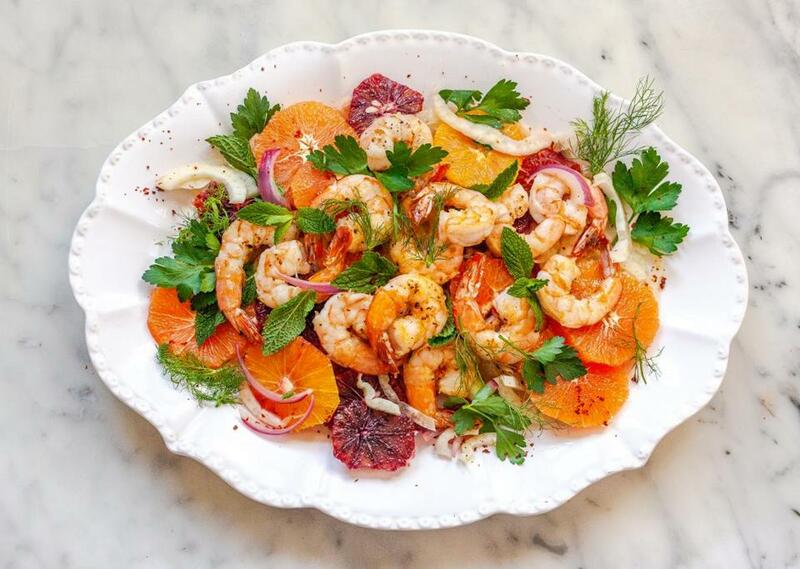 For the winter-weary, this fennel salad, with Cara-Cara or blood oranges — for their beautiful color — is garnished with pan-grilled shrimp. The results are crunchy and refreshing and just what the season needs. Shrimp in the seafood case of your market are usually labeled “previously frozen” and are defrosted at an indeterminate time. You’re better off buying frozen unshelled shrimp with “IQF” (individually quick frozen) on the label. They’re flash-frozen at the harvesting site and defrost quickly in a cold-water bath. Pink and white domestic frozen shrimp from the Gulf of Mexico are the best choice if you want to avoid imported shrimp, which have controversial harvesting practices. To peel shrimp, grasp one by the tail. Start at the large end (where the head was), pull off the legs and outer shell together, and leave the tail segment attached and unpeeled. With a paring knife, make a shallow cut along the curved edge of the shrimp and tease out the mud vein with the tip of the knife. Peel the shrimp yourself or buy ready-peeled large shrimp and this salad will be just the right antidote to winter doldrums. 1. In a small bowl, whisk the orange and lemon juice, vinegar, salt, and pepper together. 2. Slowly whisk in the oil. Taste for seasoning. Add more salt and pepper, if you like. 1. Bring a kettle of water to a boil. In a large bowl, place the onion slices. Pour boiling water over to cover them; set aside for 2 minutes. Drain in a colander and rinse under cold water. Pat dry. Return the onions to the bowl. 2. Add the fennel slices to the bowl and toss with half the dressing, salt, and pepper. 3. With a serrated knife, trim the ends of each orange. Stand 1 orange flat side down on a cutting board. Using a sawing motion, curving with the shape of the orange, cut the peel and pith from top to bottom. Repeat all around the orange until it is peeled. Slice the orange into rounds. Repeat with the remaining oranges. 4. On a platter, arrange the fennel, onions, and orange slices. 5. In a large, heavy-based skillet over medium-high heat, heat the oil. Add the shrimp and spread them out to make 1 layer in the pan. Cook for 1 minute. Turn and cook for 1 minute more, or until the shrimp are cooked through.